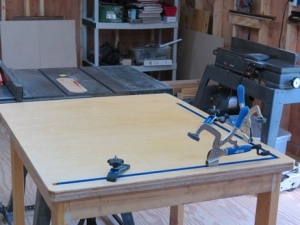 Homemade outfeed and assembly table incorporating T-tracks embedded in dados at 90 degrees to each other. T agree about the added usefulness with t-tracks...would more actually be better to allow clamping everywhere? Those T-tracks make a world of difference in the usefulness of this table.